Discussion in 'Discussion Group' started by Sherry A., Jan 27, 2013. What are those things on the lower shelves? I never saw them in my kitchen. IKEA sells that sort of cabinetry. Okay, that really is cool. And, looking for ideas as we're hoping to build. Thanks for sharing! The antique version ... my grandmother's house plan. Auxie, Sherry A. and Hught like this. 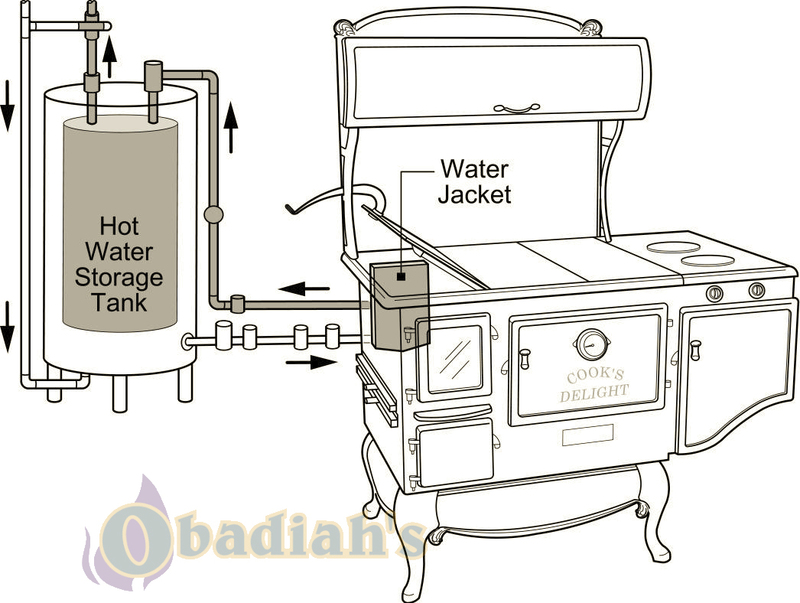 This model had a water jacket to heat water for storage in ~30 gal tank. 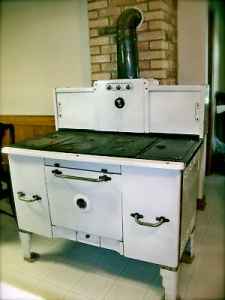 The only stove I ever saw my grandmother cook on as the electric stove was for storage. Nice.....looks like it’s built like a battleship! But why the 30 gallon water heating capacity? What was THAT feature used for? Drawing a bath while flipping pancakes? It was the water heater for the house. Any hot water was heated via the stove, which was an 1864 design and always had a fire in order to cook and have hot water. Yes, this one heated water for the shower in the basement or tub in the bathroom though. I never saw the electric stove used, which was probably a good thing since when I was older I looked at the wiring and the fuse box was 60 amp service .... about what a stove would need without the rest of the house. The heated water tank is shown on the right. I have limited references here, but it looks to be the same or maybe a similar set up to a wood fired hot tub heater. I guess the more things change, the more they stay the same. Gotta respect how solidly built all those stoves are, though! Whoever built them, thought about durability lasting well into the future. They really did. I know the stove was an 1864 Model, but not what year it was built. I do know that it was in constant use for at least 50 years. Not many things now are built to last like that. You think about the pies going in and I'll think about the ones coming out. LOL, cool piece it is. Are you sure that's a Heated Water Tank and not a Still? Our hot water always came from the stove top. Yep. some models had a connection where water could pass through a jacket around the firebox and once it was heated pass to a storage tank. The convection kept it circulating until it was used and colder water was introduced.